Commemorate each 2018 post season game with the "Victory Coin" available for only your team or the 7 coin collection for each series victory. 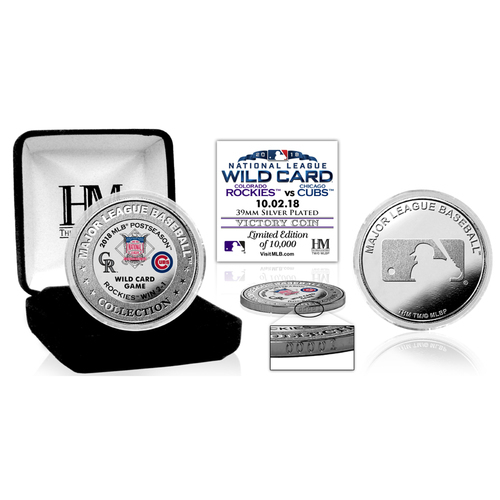 This 39mm silver plated minted coin is embedded in the center with a color image of the dueling teams logos and games won in the series. Only 10,000 coins will be minted for each match up. Each silver plated coin is individually numbered on its edge. The "Victory Coin" is protected in a hard acrylic capsule to preserve its condition and delivered in a custom velour jewelry box. Officially licensed by MLB and each is accompanied by a certificate of authenticity. Proudly made in the USA by The Highland Mint.